Hubby and I have seriously been talking lately about moving. Seriously. Like so seriously we’re packing boxes of junk to store in the attic and purchasing paint to spruce this house up to put it on the market. While I love moving, and the whole “starting over” feeling, I do NOT love selling houses and the packing/cleaning part of it all. If I could skip that part, I’d be overjoyed, but seeing as how we only have one tree in our yard, and it’s not a money tree, selling the house is a necessary part of the equation. Remember the rule of 3 – no more than 3 of something on a shelf or table (i.e. don’t put big heaping piles of junk on your shelf – if you have candles, only put 3 in the grouping). Limit amount of personal stuff on display. And then there’s my personal “favorite” – Don’t have a lot of books on your bookshelf. What?! It’s a bookshelf. Apparently, home buyers don’t want to buy a house from people who read. People who read obviously have problems. They probably have insects or rodents. They probably didn’t water their grass or change their furnace filters because (gasp) they were… reading books. When I vented about this moronic “no book” rule, Hubby said to me, “Why send me to the class if you were gonna pooh-pooh everything they said?” Truthfully, I don’t know. And there probably is something to that rule and I will dutifully pack up all my (gazillion) books if that gets our house sold, but I’ll complain about it the whole time. Though the prospect of moving is exciting, it’s scary at the same time, but I long to have more room and more space for my books (wink! ), as well as the masses of stuff that you accumulate when you have children. I’m looking forward to a home with a playroom or a large family room to store the two dollhouses The Princess got for her birthday (as well as her three new Barbies, and Barbie’s Summer and Fall wardrobes). Today you are four. In fact, your official “birthday” is in twenty minutes – as we were blessed with your first cries at 9:03 p.m. on May 28. Being your mom is the most amazing thing that has happened to my world. I can’t even begin to tell you all the wonderful things you have brought to my life and I can’t help but think if I have brought even a fraction of that to your world than we’ll all be just fine. You are the most loving and joyful kid – you have a tendency towards the dramatic at times (I can’t imagine where you get that from! ), but you amaze me daily with the way you teeter between being a kid and being “grown”. When you were an infant, I wouldn’t let people talk to you in baby talk – and that is partly why, I think, you have this massive vocabulary. It’s funny to me to see the shocked looks on people’s faces when you make comments like, “You startled me! That means you scared me” Or “That confuses me – I don’t understand that.” You are such a sponge that in addition to picking up the vocabulary, you pick up the nuances and facial expressions of our family members – and it’s funny when I see one of my little quirks (and I have many) played out on your cute face! This week, when I taught you the phrase “heebie jeebies”, you made me laugh so hard when you finally “got it” and you said that dinosaurs gave YOU the heebie jeebies. When I told you dinosaurs were extinct and not on the planet anymore, you got this relieved expression on your face and then said, “Yay! I’m SO EXCITED! No more dinosaurs!” You are so precious!!! You are the best big sister, too. I know that it gets frustrating at times (and you tell me, “I’m just frustrated…”) because Pumpkin is getting bigger and she gets into your stuff, but you generally show her so much patience and kindness. One of these days, it’ll be a bit easier, and we won’t have to put up all the Barbie shoes so she won’t stick them in her mouth. One of these days, she’ll be a big kid like you. I love how when we pick you up from school, you are anxious to show her off to your friends – you give her hugs and kisses and you want to show how she can do high-fives. It amazes me that you write your name perfectly now. How you ask me how to spell something and then you write it on your own. You’re FOUR! And you’re WRITING! You like to make up songs on the fly, and you like stories that rhyme and you love music. Right now, you are hooked on Radio Disney. You like to parrot commercials back to me (asking me if I prefer Juicy Juice or 100% grape juice instead or telling me that Rice Krispies is part of a “nutritious breakfast”). You are a marketer’s dream, little lady. You make me want to do mom things. Before you were born, I never thought I’d be some minivan driving mom who tried to organize birthday party activities and games and all that, but it’s amazing how even though I make you ice cream cakes where the middle runs out like gross mush (sorry about that, by the way), you make me want to try. And it was worth it to make a gloppy cake to get to spend that time in the kitchen with you, mixing the batter with you, and making the ice cream pink (what fun!) with food coloring, and frosting the cake together. Hey, it mighta been a mess, but we had fun, didn’t we? (And licking the bowl – mmmm). Making you happy makes me happy. You know I love you with my whole heart. I’m so very lucky to be your mom. My daughter, the underwear psychic. Isn’t she gifted? I am the laundry goddess. I have just started my second load of the four loads of laundry I will do today (I have also just taken three ibuprofen – related? Possibly). It seems as though I just did laundry a few days ago. In fact, I did do laundry a few days ago. There are only seven days in a week, and four people living full time under this roof (though Stepson adds to the laundry demands every other weekend) – how do we wear so many clothes?! I’m working from home now, which means theoretically, I could wear the same outfit seven days in a row without washing it (But don’t worry, I don’t do that!). Pumpkin doesn’t really spit up or get her outfit changed during the day that frequently (unless there is a dire need like a major weather change or that occasional spit up). Hubby wears the same basic thing to work daily (though I’ve noticed his trick is to pile things up in the bedroom and not really put them in the dirty clothes until the laundry is so full of other stuff. I realized yesterday – the culprit? It’s The Princess. She changed her outfit THREE times yesterday. The first outfit was fine – it didn’t match. T-shirt and shorts – both had the color pink in it, so in her eyes, they were a match. I don’t believe in fighting with a kid over her wardrobe – generally because if my daughter doesn’t match, people won’t blame me. They’ll look at her and figure one of two things: a) daddy picked out her clothes or b) she picked out her own clothes. Since neither option implicates me, what do I care (now when her hair isn’t done on the other hand, I am so busted! As she told her preschool teacher the other day, “My mom forgot to do my hair today so I had to do it myself!”). My mom arrived to take The Princess on an errand and said, “You don’t match – you should change your outfit!” (Hubby later commented, “Where were they going? A fashion show?”). The pair came home from errands, and about an hour or so later, she was changing AGAIN. No wonder I’m buried in laundry. Stepson is no better. After spending two nights here, I typically have to wash four pairs of pants, three shirts, two pairs of pajamas, MAYBE one pair of socks (he either never changes them or hides them), and countless pair of underpants. Half of the things I end up washing, I’m not entirely sure he’s WORN duing that time, he just thinks it’s easier to toss it in the wash than to put it away. I’ve started laundry load 2, and I have yet to fold the stuff that has been sitting in the dryer for four days. No wonder I have a headache. I took the girls to get their pictures done yesterday. I am a major picture junkie – love having the girls photographed and love having new pictures to frame and display in our house. Since The Princess will be four in just a few days, and I was a few weeks overdue for Pumpkin’s 9-month pictures (yes – for the first year, I get pics done every 3 months! ), I decided I’d take both – get individual shots of each girl, plus some of those adorable shots of them together. Out of twelve shots – there were NINE excellent options. Only three pictures that I turned up my nose at – the rest were good. I had brought my mom with me to help keep the girls together and smiling for pictures – but mom’s biggest accomplishment was helping me spend too darn much on pictures. Of course, it cemented in my mind even further that I have the cutest kids in the world. Or the hammiest. It’s amazing to get to stay home with my girls every day – when The Princess was a baby, I didn’t have the opportunity to be as involved in her life as I am now. I feel a renewed sense of motherhood (cheesy, I know) with The Princess, and I feel like I have been able to bond with Pumpkin. Expectedly, of course, I am now in the role where I know their routines better than anyone, and perhaps, also expectedly, I am somewhat territorial about said routines, and am getting pretty obnoxious about it! What does he actually do? He decided to POSTPONE THE NAP. By about two hours. He took her out and about, ran some errands, and she never fell asleep until they got home. It threw the afternoon nap off kilter, and now, the day after, I hear her babbling in her crib – not quite sleeping. Here’s hoping we get our habit back. Of course, to him, it’s no big deal. To me, it’s like an almost insult, because ultimately, I’ll be trying to get our schedules back on track for the next few days. I’m even territorial about the way the dishwasher is loaded (c’mon, I can’t be the only one!). This is one battle I’ve kept my mouth shut about – because I’ve learned that if I say anything, anything at all, no one will help me load the dishwasher. BUT – my way? I think I probably get a good 20 – 30% more dirty dishes in the dishwasher the way I load it. How pathetic is it that I have a preference to how the dishwasher is loaded? Disturbing, yes? I think it’s hard for a primary caregiver (be it mom or dad) to relinquish control to the other parent at times, so I’ve really had to make an effort to keep my lip zipped. It’s more important to me (despite my grumping) to have Hubby be involved than it is for me to have it my way all the time. Makes me wonder if this is biological or just habitual? What to do with ALL THESE KIDS?! The Princess is turning four in less than 2 weeks, so we’re planning a birthday party. This is the first year we’re inviting “friends” of hers and good gracious, I’m pretty freaked out at the thought of all these pre-schoolers taking over my house (including The Princess, we’ve got five definite “yeses” at this point). I’ve got the cake planned (and a pretty cool unicorn cake-topper), Hubby has his mind set on having a pinata. I’m hoping that there are people reading this who might be willing to share with a non-Martha-Stewart-type mom things to do to entertain kids at a birthday party. 1. The bride looked gorgeous! I hadn’t seen her dress pre-wedding and it was exactly what I could have pictured – very elegant, classic strapless gown with some beaded detail on the bodice. I was glad to stand up there with her (thank you for including me, M! I hope you are having an awesome honeymoon!). 2. Bridesmaids playing air guitar on their sashes. These dresses were pretty long, with a long sash that hung down the back and trailed behind us on the floor. Towards the end of the day, mine was doubled around my waist and tied again kimono-style, but other ‘maids used theirs to play some “guitar” like AC/DC during “You Shook Me All Night Long”! 3. 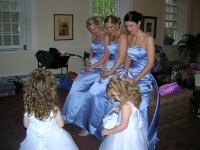 The Princess (little blondie up there in the picture – I’m on the far right, by the way) was a great flower girl, and she done me so proud. It was a long day for her – but I got tons of proud mama photos of my little lady during the day. Between the wedding and reception, she zonked out in her booster seat in the car within five minutes of being buckled in. At the end of the night, she cried before leaving because she “hadn’t danced enough yet”. 4. The DJ rocked – instead of an Enya/Kenny G dinner hour, he played classic pop tunes, such as “American Pie” (one of my all-time favorite songs, by the way), “DayDream Believer”, and other such tunes. Once the dancing started, he kept things moving and kept the dance floor pretty packed with a great mixture of music genres – old school and new. 5. Cheesecake. For the cheesecake alone, I would have worn my dreadful shoes for a few more (painful) hours. I picked out the shoes, and would have kicked myself for picking out such dreadful shoes – except my feet hurt too freaking bad. 6. The moment I took off said dreadful shoes and put on my lovely flip-flops. Happy feet. 7. It’s funny, I’ve been friends with M for 16 years now and she has several groups of friends from different parts of her life – and until now, we had co-mingled somewhat – but through this all, I’ve gotten to bond with them, and I think I’m really gonna miss them. Between planning emails and exchanging photos, we’ve gotten somewhat close (and one of the gals even got me blogging! ), and so I hope that continues.